The city’s Real Estate Services & Capital Asset Management division’s Dan Rip (far left) says there are no funds to restore the property. 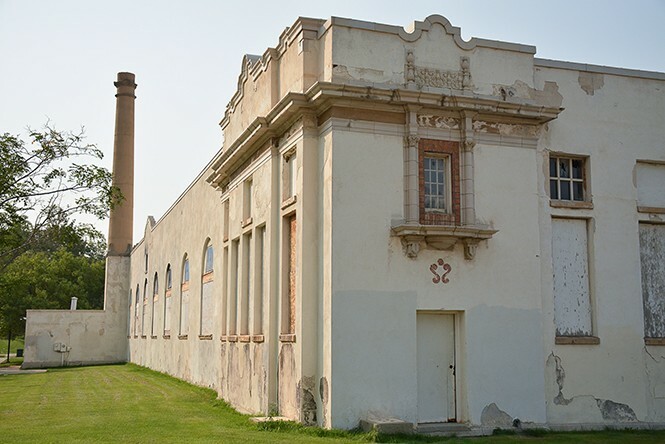 Between two lonely parks in northern Salt Lake City sits a perpetually locked building from a bygone era. Hidden within its decaying chambers, dusty museum exhibits feel locked in time and give off an eerie feeling that the previous occupant might have been suddenly raptured away. Novice wall paintings, origami, toys and kids' socks intermingle with loose screws, wayward plaster scraps and casual litter. Venturing further inside, an eastern door opens into a cavernous concrete room where a massive swimming pool sits empty but for the debris, rubbish and leftover office junk resting on its bottom. Sounds echo off the chipped tile, and caution tape wards away all from the wooden balcony bleachers above. A second, smaller pool room abuts the first. It's just as empty—has been for more than 40 years. Except for the occasional squatter or city employee, the rooms and halls of this elaborate building on 800 North and Beck Street have been vacant for 10-plus years. But it hasn't always been so desolate. In its nearly 100-year history, the Warm Springs Plunge building has seen thousands of faces pass through its doors. At its peak, folks soothed themselves in its naturally heated pools and massage parlors; they ate and lounged in its eatery; and they socialized in its chambers until it closed in the 1970s. For a dormant decade, the building was quiet. The space sprang to life again in the early 1980s when the Utah Children's Museum moved in. Around 2006, the museum relocated, and the building hasn't had a new tenant since. Because of the alluring warm springs that trickled out of the mountainside and puddled up among the vegetation, this area of town historically has been a communal rendezvous. Not three days after LDS prophet Brigham Young authoritatively declared Salt Lake "The Place," the Mormon leader paid a visit to the warm springs—voluminous enough to cast up plumes of steam, even in the summer. Within weeks, a team had excavated a pool that could hold up to 16 bathers at once, according to Michael McLane, author of a forthcoming book about the history of Beck Street. The settlers used the springs to perform baptisms, but the pioneers also believed the warm water held healing properties, making it a ceremonial and clinical nexus. In its heyday, the Warm Springs Plunge was marketed as a place where travelers could soak and replenish on their westward treks. Well before Mormons commandeered the Salt Lake Valley, the springs were used as wintering grounds for Native Americans until about 1848, when measles decimated scores of tribe members. McLane speculates that either the water was a vector for the virus or that the popular gathering place put Native Americans in proximity to a newly arrived, infected Latter-day Saint. Where the Utes and Shoshone saw ominous death, the settlers saw dollars signs. "Young was an incredibly astute leader. Say what you want about anything else about him, but he was very savvy," McLane says. "He knew that the city, even with its communal economics, was going to need external revenue coming in." A potential respite for East Coasters traveling to California, the pools were marketed as a place gentiles could soak for a bit on their westward treks, and Salt Lake's warm springs were among the most premiere on this side of the Mississippi. Despite its burgeoning reputation, the warm spring industry never reaped the expected bounty. James Hendricks, an ecclesiastical leader of the fledgling 19th LDS Ward, built the first bath house, which doubled as a church. Hotels and saloons popped up nearby. Describing Hendricks as a "great bishop, but a terrible businessman," McLane says the enterprise floundered. The bath house changed hands several times with only modest levels of success. 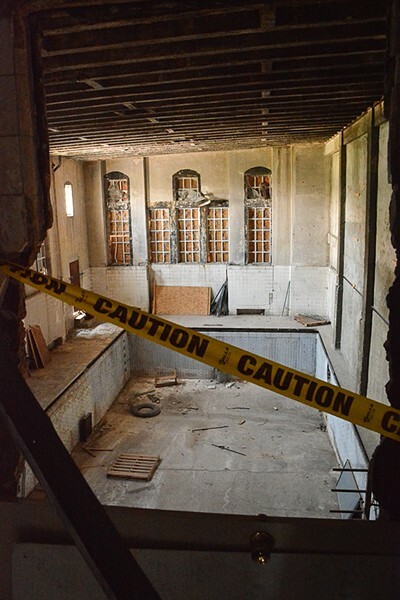 Construction began in 1921 on the bath house that now stands for a city-owned amenity with hot spring water piped into its pools. 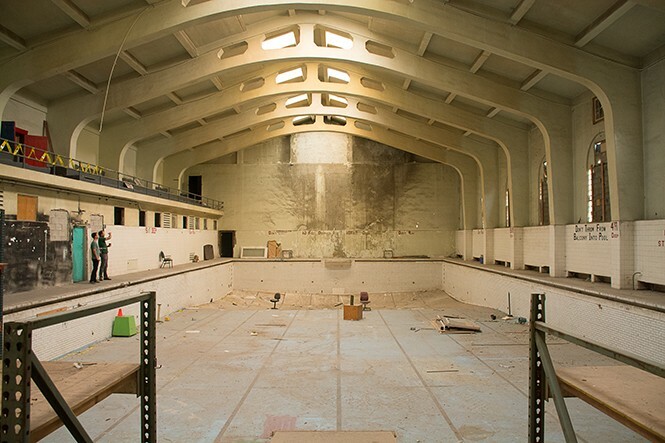 For half a century thereafter, the building, known as Wasatch Warm Springs Plunge served as a communal swimming area. The city pools weren't without problems. In the 1950s, it was discovered that the water was rife with sanitation concerns. When the city tried to chlorinate the water, it didn't work, McLane says, and instead created harmful vapors. So officials capped the pipes, drained the large pools of spring water and then refilled them with ordinary water. All was well until the roof started falling down. One day, pool staff returned to find a 4-ton chunk of concrete in the water. "Had that happened at peak hours, you would have had dozens of people killed, most likely," McLane says. The bath house closed in the early 1970s and reopened in 1983 as the Children's Museum of Utah. Nearly 20 years later, the museum moved to The Gateway. One occupant, however, remains. 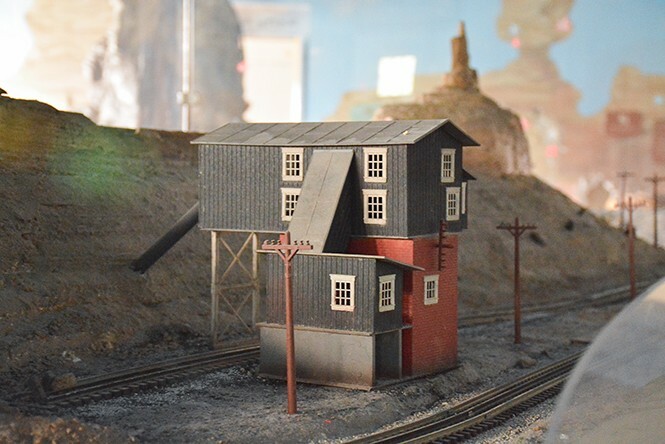 In the basement, the Golden Spike Train Club of Utah holds monthly open houses, where guests are invited to marvel at the assiduously crafted model-train layout. The club has called the place home since 1984. Through the years, they've constructed an elaborate train system with switch lines, bridges and tunnels that cut through a miniature mountain pass. Figurine people dot the rail yards, and evergreen trees spring from the artificial granite slopes. The 20-scale-mile network of rails and meticulous scenes are a perpetual work-in-progress that would be impossibly cumbersome to relocate, notes club member Mark Forslund. "We are hoping to sign a lease eventually to secure our future," he says. But the city is cautiously reluctant to enter a long-term tenant agreement while the future of the building is questionable. "We have a huge stake in this," Foslund adds. Over the years, the city has received numerous restoration plans, but those proposals always smash into a big brick funding wall. Leaving the building vacant will only exacerbate its path toward abject disrepair. "The longer it sits, the more dilapidated it becomes," says Dan Rip, the city's Real Estate Services & Capital Asset Management division's property manager. "We don't have the funding to renovate or restore it. The problem that we're having is the roof is in terrible condition, and our fear is that the longer we let it sit, the roof is going to give." The concrete swimming pool floors are irreparably damaged, as well. In the wet months, he says, rain pours through the ceiling, and to fix the roof alone is an estimated $1 million project. A year ago, the city issued a request for proposals, an offer to developers, asking for $2.5 million for the building and about 2 acres of land. The city received two responses by the late 2016 deadline. David Ross Scheer, a member of the Capitol Hill Neighborhood Council, was selected as a community representative to sit on an ad hoc board to review the proposals. The more viable of the two submissions, he says, was a housing development plan from Woodbury Corp.
"I knew that the community did not want housing there," he says. "But at the time, it looked like the only chance to save the building." No one from the Woodbury Corp. familiar with the project was available to comment. But a Salt Lake City Historic Landmark Commission work session memo provides a detailed proposal. The plan calls to erect a seven-story apartment complex in the parking lot that would loom between the Plunge building and the hillside beyond. Four town homes would line the southern edge, and the Warm Springs Plunge building would be renovated and leased as commercial office space. The Woodbury plan is primarily targeting development on the parking lot. Rip reasons the proposal leaves open the door to renovate the historic building for private and public use in creative ways. But others worry a giant building would dominate the surrounding parks and ruin the viewshed. Don't expect apartments to sprout up overnight, however. Woodbury has considerable hurdles to clear before it can break any ground. The building is on the National Register of Historic Places. More importantly, Wasatch Warm Springs Plunge is on the list of Salt Lake City landmarks, which means in order to continue with the proposal, the developer would have to get approval from the Salt Lake City Landmarks Commission. The space is currently zoned as public lands, which would have to be changed by the planning commission before housing could be a permitted use. The city is also asking the Capitol Hill Neighborhood Council for feedback. Is the proposal feasible? "It's hard to say," Rip says. The corporation is expected to present its latest draft at an October meeting. Scheer believes that if the neighborhood voices "strong public opposition to something that is already teetering, it could easily push it in a direction of denial." And that would leave the city in the same spot it's been: watching an architectural treasure crumble before its eyes. Sylvia Nibley, founder of the Warm Springs Alliance, notes that the space has historically been used as a public good, and it would be a shame, she says, now to privatize it. A visionary, Nibley describes herself as "a protective mother of this place, and I love it." Her concept is ineffably grand in scope, but cuts to the core of what it might mean to the community. The alliance envisions a place where connectivity is more important than commerce—a spot filled with art, music, lectures, dining and dancing, where people of all backgrounds feel welcome. The alliance also wants to re-establish soaking pools. "I see it as the potential to be many things to many people," Nibley says. "Bringing back the hot springs allows us to have this public feel in coming together around healing and health and well-being. More like a European spa or Asian spa. Not the kind of exclusive, only-for-the-wealthy day spa. A place for everyone." On its website, the alliance links to a petition that favors its plan as an alternative to the Woodbury proposal. Funding, Scheer agrees, is still a major obstacle. In 2009, the city estimated restoration costs to be $9 million. Scheer, an architect and city planner by trade, guesses that number would be in the ballpark of $12 million to $15 million today. Because the building is historic, whoever purchases it should be able to apply tax credits to the sum of the restoration costs. Nibley is more sanguine than Scheer or Rip. "We have some projected funding sources, preliminary business plan and strong interest from people and organizations who would utilize the space," she writes in an email. The train club might have a funding role, as well. Members are eyeing Union Pacific grant dollars, one of three railroad companies the yard is based on. Originally, the train club opted to remain neutral on the development proposals. Since then, club members agreed to side with the alliance. "We are looking at the best community-driven plan because we are part of the community ourselves," Forslund says. Even when you add up all the tax credits and possible grant dollars, the price gap to refurbish and maintain the building is huge, Rip says. First and foremost, the alliance exists to preserve and protect the area's history; Nibley says it will continue appealing to the public with that end in mind. As the alliance continues to grow and gain steam, it can collate ideas and formulate a solid alternative. "We also see its potential for being a community gathering place again. We would love the opportunity to restore it and bring it back to serving the community. "That's its purpose," she says.